Discussion in 'Audio Hardware' started by StateOfTheArt, Oct 2, 2018. After hours and hours of exhaustive research (and yes.. even searching threads here.) I simply cannot decide - I am officially starting my audiophile career with some "real gear". The following amps have great features, I play mostly vinyl (U-turn Orbit - 2M Red - upgrade that as well possibly to the 2m Blue), but want to stream my FLAC's as well. Either from my phone via aptX or laptop. Thank you all in advance. I am looking forward to suggestions, but please remember I'm just starting out from pretty crappy gear, I have 2 kids to feed, and a young professional without much cash. Thanks again all! Consider specs in respect of speaker choice - some will provide more low end than others, the B6 will have more than the Zensor 1, for example (perhaps the Zensor 3 is a more apt comparison here - I can personally vouch for it being a great speaker). They're all reputable speakers and good choices. As ever it's a personal thing - demo if possible. Amp wise, choose based on features, available wattage and styling. I believe the Onkyo is well regarded. Also consider Marantz and Yamaha's lower tiered offerings, also well regarded. Ivand, G B Kuipers and Dennis0675 like this. I think you have arrived at some fine options, a credit to your research. I think you could go with any combination of those options and be in good shape. I’d pressed I’d go with emotiva and Dali. With that said, how big is your room and what are you currently using for an amp? What improvement are you trying to make? If the amp options are not a huge improvement over what you have I would put 100% of your budget into speakers and get floor standers. And....with $1000 I would be shopping your local Craig’s list. Speakers and amps are just about the most durable technology you can buy, getting them second hand is a very safe bet and you can get much more for your money. The down side would be the DAC in in the integrated. That’s the spot that doesn’t age as well. Vinyl Archaeologist and timind like this. You won't find this level of build quality in any current <$1K integrated. Certainly conservatively rated at 50 watts/CH. -an even better deal. I've had an itchy trigger finger on that one. somnar, Archguy and Dennis0675 like this. Wow. Thanks for all the suggestions. Those paradigms are delicious looking. 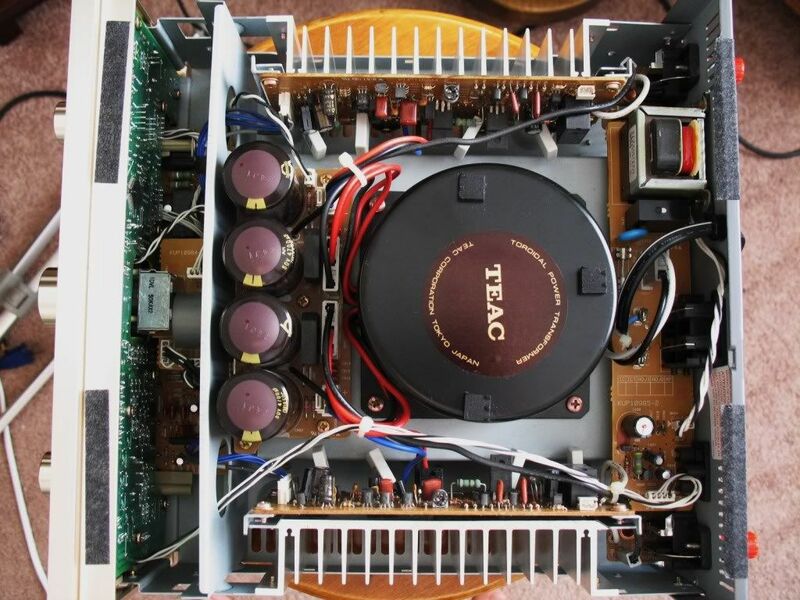 That teac is great as well. Ahhh, so many choices. What I have currently, well, isn't much at all. I have a pair of edifier powered speakers. Orbit TT to the pluto preamp to the speakers. Edit it's a small apartment, we won't be here forever, but space for floor standers isn't something I think we have at the moment. An apartment and big tower speakers could make some problems you don’t want. You might think about keeping what you have and putting together a headphone systems. A set of cans and a headphone amp with your budget would get you some great results. Go used for the speakers. I actually use headphones at work - they're budget cans - plan on upgrading those. This is what I ultimately went with, from your advice and Micheal Fremer's as well. I think its a great budget setup. Thanks all for the help and responses. In the headphone department - for the future - you think the Sennheiser HD660's? bhazen, DocBrown and Dennis0675 like this. This way - as well, it gives me somewhere to go. I really didn't want to end up with "endgame" caliber things. That wouldn't be any fun, now would it? The Onkyo is certainly more "traditional" looking but the Emotiva is claiming 20 more WPC which is a big deal when comparing to a 30 WPC amp. I think the Emotiva is going to have a a better phono section. I really don't know as I've not heard the Onkyo but Emotiva does make a very nice exteral that I would imagine is close what the TA-100 has. Like I said up thread, I'm sure you will be in good shape either way. Just be careful with a 30WPC SS amp. If you push it too hard it will clip and can damage your speakers. I've been there and done that. I like Emotiva gear. People like to take pot shots at it, claiming it to be mid-fi and other such nonsense. 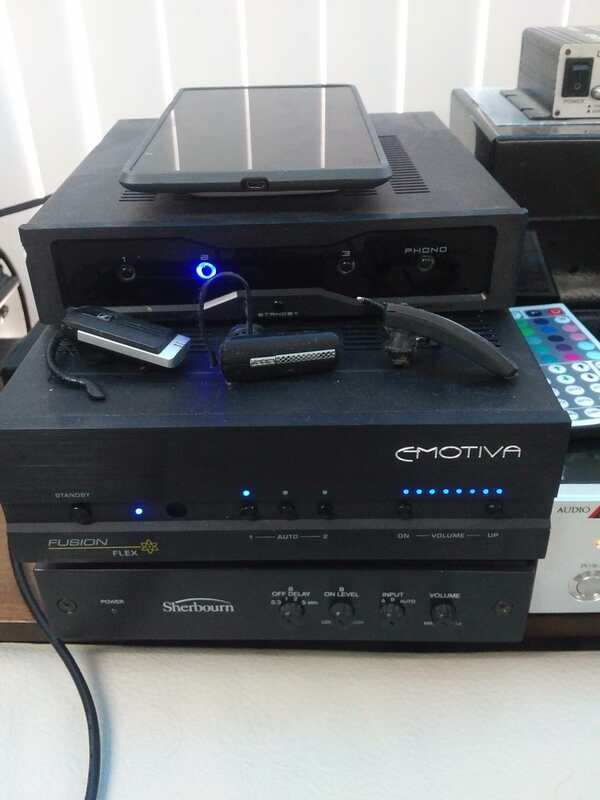 Although these are from 1012, these Emotiva amps are what I have been using for six years and they are very well made products. The main power amp is on the bottom right. The center channel mono amp is on the bottom left. Above it is their new 4k processor from the same BAS-X line, which replaces their older UMC-1 processor. Here is their older Fusion Flex 50-Watt amplifier, which I use for the rear channels. Above it is their analog input extender and SS phono preamp. I really think that you are getting a superior piece of gear at a certain price point from Emotiva. They have always sold via Internet direct with no middle man. I think they offer a better product with complete support, warranty and technical, in the USA. Consider Emotiva, I don't think that you are making the wrong choice. Hm - ok - I will thanks guys. 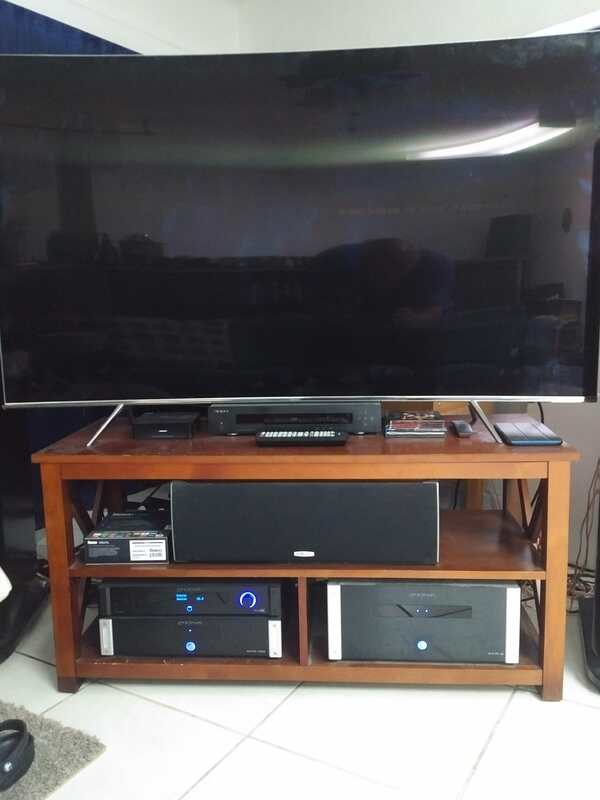 I'm going to audition the Onkyo - see where I stand with it. I'm still open to the Emotiva - it's just its a lot of "stuff" and with all that in there - it may negatively impact SQ no? Wait you said A-9150 is 35W? It's 60W into 8 ohm - isn't that around 50W into 6? No its more like 65 into 6 ohms. Ah - goes the other way - got it. a marantz pm 5005 integrated amplifier and a set of wharfdale 225 speakers will sound so much better than anything on your list. space for floor standers isn't something I think we have at the moment. As for "want to stream my FLAC's" that really might merit another thread to get better information. How are they stored? There are some receivers set up to attach like a hard drive, not sure if that Emotiva will do that. Those, however, are likely to not have a phono stage. it seems the Emotiva cannot properly connect a subwoofer, i.e. there is no way to cut the bass out of the satellite speakers and main amp, so they keep straining away to try and reproduce the lowest notes. This is not just Emotiva, it's a very common and stupid disease of much 2-channel equipment. Only a few NADs, an Outlaw and a...Parasound?? Another thing I read indicated other Emotiva units had bass management. OR, try to fit towers, or larger bookshelves at least. Google "Hoffman's Iron Law" and you will see that bass requires woofer size and box size. Definitely get 6.5" woofers in preference to 5." This NAD NAD 7250PE amplifier/receiver additionally has pre-out/main-in jacks so you CAN hook up a subwoofer, and get a little Harrison Labs F-mod highpass (a bit crude, but effective). The other CL listings are either too expensive, too old, or no phono input. The ELACs all have quite strong bass, though I'd try to move up to the Uni-Fi series. So wouldn't that be around 40-45 watts x 2 into 6 ohms? I agree with Denniso675: I would be careful about turning up that system too loudly (though if you're in an apartment, that's probably a wise decision for maintaining good relations with your neighbors...) and clipping and/or damaging your speakers, but chances are the system you chose is going to sound very pleasing at low to moderate volumes. I've got a combination of Denon receiver and ELAC B6 speakers (also 6 ohm, like the B6.2), and the Denon receiver claims to put out 140 watts at 6 ohms. While it's plenty loud enough for me, most of the time, there is a harshness or thinness in the sound that seems to appear at those higher volumes, and the bass response is never gonna be awesome when the ELACs can only go down to about 44 Hz. Nonetheless, I am still wondering if there's some "oomph" in a higher-quality amplifier that could be advantageous to help the music breathe more. 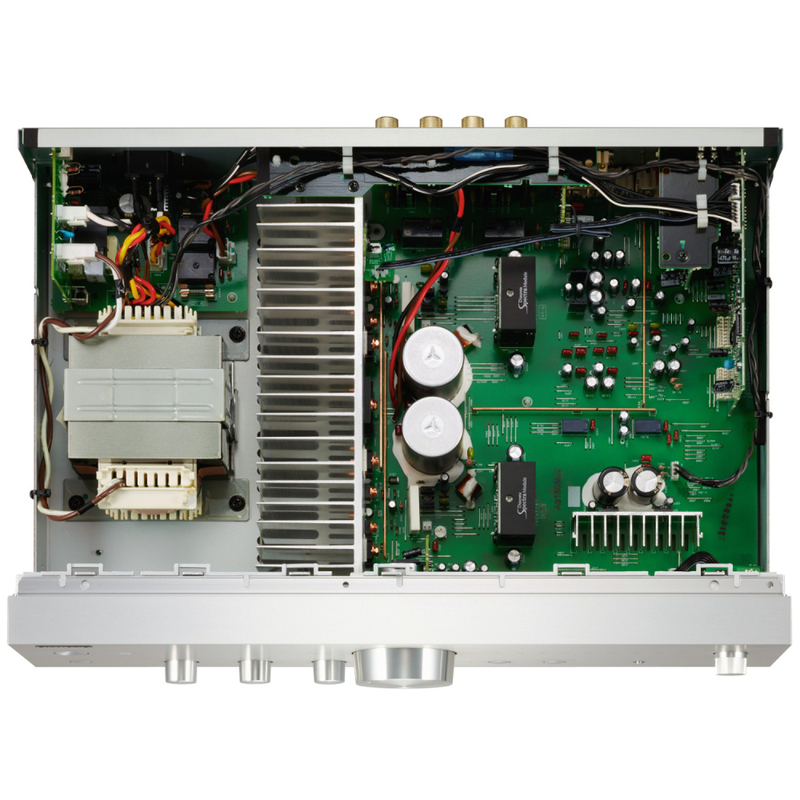 I'm tempted to upgrade my receiver eventually, to an integrated amplifier like the Parasound HALO, which would put out more like 200 watts at 6 ohms (and with much less distortion than the Denon). Or get an external power amp (like Parasound A23) and just use the Denon as a pre-amplifier. I'm curious to hear how ELAC B6 speakers might sound with more clean power like that! Sorry didn't read the specs, assuming a cheap amp with a wimpy power supply wouldn't have much headroom. 6 ohm rating is kind of superfluous, just a way to make an amp look more powerful than it is. If I had the cash - I would have purchased seperates. That is the way to go if you're not under a strict budget - because your power section is well - just power. The preamp can be switched for tonality/connectivity. I purchased from Amazon Warehouse - so if I don't like them - back they go. I am still on the fence with the Emotiva. All that connectivity, it is bound to bring out some bad things, no? Like I said, I asked Micheal Fremer about all of this - he replied "I've heard the Onkyo - go with that or a Sprout". The Sprout was a little out of my budget range with the speakers and cables included. I wanted good connections with my system. And, yes, I'm in a condo - this will be used at normal listening levels, probably lower. 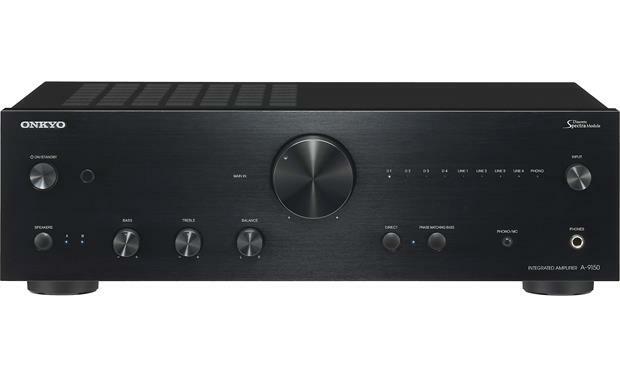 Looks like the Onkyo has pre-outs as well, so you should be able to do what I daydream about doing: connecting an external power amp to the Onkyo and using it only as a pre-amp. So you can gradually convert this modestly-powered system to a dynamic powerhouse in the future. Personally, I think you've done well for about $1,000. Good engineering/implementation can overcome your concern. I haven't heard Emotiva so I can't speak specifically about that unit, but generally I would not disregard it just based on the "too much connectivity/features must mean it can't sound good" logic. I would read as many reviews as possible and demo it if I could before I made up my mind. Having said all that, you've already got what on paper seems to be a very solid "starter" system. Hopefully once you get it set up and start listening, you will forget about Emotiva. For a few years at least, until the upgrade bug inevitably starts to hit you. SandAndGlass and StateOfTheArt like this. I like the speakers! I may inquire on the B&Ws if the Elacs are no good. Again, from advice given to me by longtime, serious, money spending Audiophiles (think 1M+ in gear). They advise against used amps and receivers, that they will always have a $urprise in store. So, better to buy new with warranty, and return policy. One thing thats a bummer - I don't know how to connect my laptop or cellphone - I know bluetooth is quickly changing - so I wasn't sure if I should add that on standalone. Should I get an add on network player into this power section?